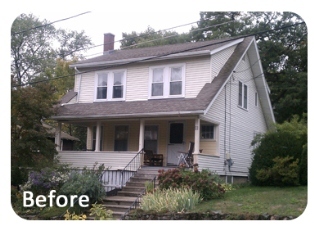 On this home in Waltham, Mass we removed the existing two layers of siding. Installed new blown-in insulation and then wrapped the house in EverWrap Moisture Barrier. We installed new Everlast Composite Siding in the Seaside Gray color. We installed new trim around the windows and doors, new fascia, rake boards and soffits. We also installed new windows in this home. There are many siding contractor in Waltham that this couple could have worked with, but we're thrilled they chose us! Here's a note they sent us after the project.